From a fashion perspective, Meghan Markle's royal tour is the gift that keeps on giving. You already know that we extensively covered all of her outfits from Australia, Fiji, and Tonga, but now the Duke and Duchess of Sussex are continuing their whirlwind tour in New Zealand—and, of course, the impossibly chic outfits have come with them. Markle's latest New Zealand outfit includes her favorite Aquazzura shoes, which she also owns in black and has worn numerous times since becoming a duchess. She's also been showing off more casual outfits on this stretch of the tour, including the Club Monaco trench coat and Stuart Weitzman ankle boots she wore to a café meeting in Wellington. 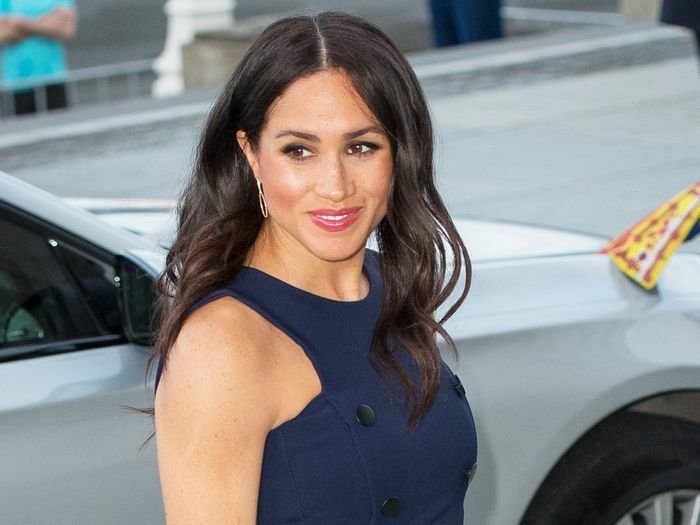 For a rainy stroll in Abel Tasman National Park, Markle wore the vegan sneakers fashion girls are obsessed with: Stella McCartney Stan Smith Sneakers ($325), which are selling out insanely fast. We first covered the sneaker launch back in September, and none other than Madonna is a huge fan as well. Scroll down to shop every outfit Meghan Markle has worn in New Zealand and continue the fun with her Australia, Fiji, and Tonga outfits here. Next up, shop all of Meghan Markle's outfits in Australia, Fiji, and Tonga.